Last night she was specially selected to be the flag-bearer for Team UK, today Elizabeth Newcombe was focused on a different task – intricately designing a wreath and plant arrangement. The 21-year-old (pictured) from Guildford College, which is in skills minister Anne Milton’s constituency, was “incredibly proud” to lead Team UK out at the opening ceremony yesterday. 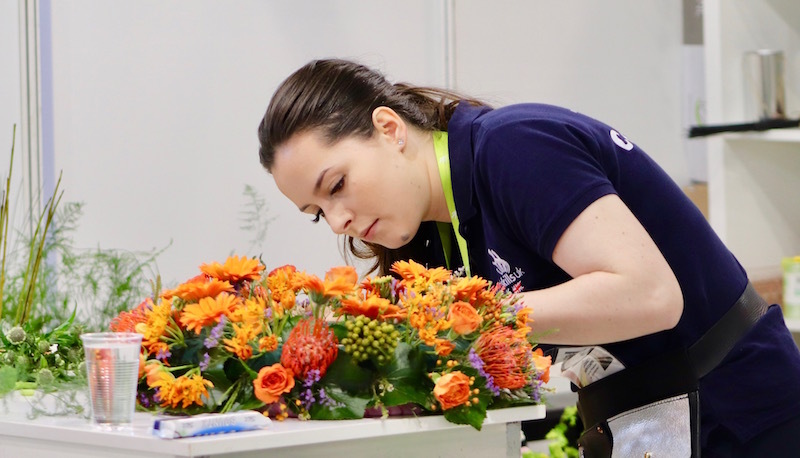 A day later she was on the competition floor at EuroSkills Budapest doing what she does best – floristry. She had to create two arrangements, one hanging wreath inspired by a museum and then a standing piece for a large foyer. “Today was really good, I’m really happy with the items I completed and I’m looking forward to the next test,” she said. Over the next two days she’ll be given four tasks. Tomorrow it will be a hand tie bouquet followed by a “surprise” task in the afternoon. Friday she’ll create a bridal bouquet and a top-table arrangement. Another Team UK competitor feeling positive about their first day was Shane Carpenter, who learns at Nescot College and is employed by BAE Systems. He’s competing in Information and Communication Technology, a duo skill, with Cameron Barr, also of Nescot College. Shane is no stranger to international competitions and competed in WorldSkills Abu Dhabi last year where he achieved a medallion of excellence. He’s feeling mighty confident about today’s work. “We completely smashed it today,” he told FE Week. “Couldn’t have asked for a better start. We followed our plan that we talked about in training, we’ve prepped well and followed the process so today has gone absolutely amazing. “Today we had to upload infrastructure servers so that they can talk to each other and provide email services and have a lot of firewall to restrict certain access to other places. He says he “mainly” returned to Team UK to “transfer my knowledge to the next candidate for Kazan” but also because he “loves competing”. “Coming back has confirmed my love for competitions. It is definitely different but I’m absolutely loving the experience e and Cameron is doing brilliantly well.